Malcolm Toft known for his legendary Trident consoles has formed a new company Ocean Audio. 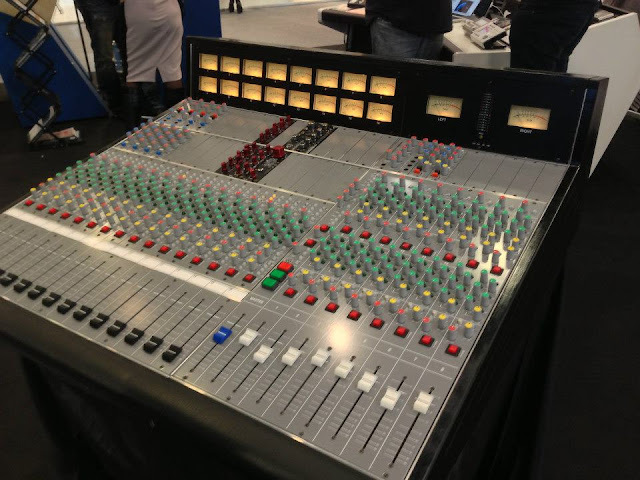 One of its most anticipated products is the Ark 516 Analog Console. The Ark 516 is fully modular and allows you to install up to forty 500 series modules directly into the control surface of the console. I'm a fan of the Trident "sound" and actually tracked quite a few records on a Trident 65 Series including Ini Kamoze's "Here Comes The Hotstepper". The 8 group faders can be used as output faders for the group, or as input faders for 8 monitor returns. The total number of inputs, available for mixdown is 48. 24 of these inputs can be on full-size faders. - Studio playback level control and selection of two track return 1, aux send 1 and aux sends 5-6. All inputs and outputs are through 25-way D-Sub connectors on the back. The top bay of 500-series slots on the input section are provided with additional XLR connectors to facilitate easy connection of microphones. Any 500-series module can be used on any channel, by using an external patchbay or through direct connections on the back. An optional 16 input expander unit and a producer desk / patchbay will also be available to further increase the flexibility of the console. Price $19,999 USD. Available in 8 to 10 weeks at LittleFish Audio. Check out the video shot at Musikmesse 2013 by Bonedo.